You're looking at a new awesome nano-material invented that does the seemingly impossible: It hides things from touch. 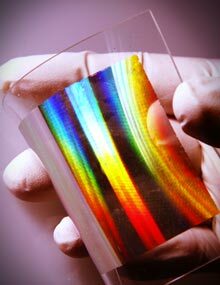 Just a thin layer of this amazing polymer will hide anything under it from being perceived by your sense of touch. In this photo you can see how it "absorbs" a metal cylinder. How is this magic possible? According to the the scientists at the Karlsruhe Institute of Technology, this "crystalline material structured with sub-micrometer accuracy [...] consists of needle-shaped cones, whose tips meet." It perfectly adapts and absorbs the shape of anything under it. The metamaterial structure directs the forces of the touching finger such that the cylinder is hidden completely. Not only your finger won't be able to detect it, but a force feedback measurement instrument will fail too. According to Tiemo Bückmann, the lead scientists in the project, "it is like in Hans-Christian Andersen's fairy tale about the princess and the pea. The princess feels the pea in spite of the mattresses. When using our new material, however, one mattress would be sufficient for the princess to sleep well." The Karlsruhe Institute of Technology claims that the material was developed for purely experimental purposes, "but might open up the door to interesting applications in a few years from now, as it allows for producing materials with freely selectable mechanical properties. Examples are very thin, light, and still comfortable camping mattresses or carpets hiding cables and pipelines below." I like that. Carpets that can perfectly hide cables is something I'd pay money for. And I'd love a camping blanket that perfectly absorbs any rock and twig on the ground, leaving a smooth surface to sleep on. Magnetic hard discs can store data for little more than a decade. But nanotechnologists have now designed and built a disk that can store data for a million years or more. Back in 1956, IBM introduced the world’s first commercial computer capable of storing data on a magnetic disk drive. The IBM 305 RAMAC used fifty 24-inch discs to store up to 5 MB, an impressive feat in those days. Today, however, it’s not difficult to find hard drives that can store 1 TB of data on a single 3.5-inch disk. But despite this huge increase in storage density and a similarly impressive improvement in power efficiency, one thing hasn’t changed. The lifetime over which data can be stored on magnetic discs is still about a decade. That raises an interesting problem. How are we to preserve information about our civilisation on a timescale that outlasts it? In other words, what technology can reliably store information for 1 million years or more? Today, we get an answer thanks to the work of Jeroen de Vries at the University of Twente in the Netherlands and a few pals. These guys have designed and built a disk capable of storing data over this timescale. And they’ve performed accelerated ageing tests which show it should be able to store data for 1 million years and possibly longer. These guys start with some theory about ageing. Clearly, it’s impractical to conduct an ageing experiment in real time, particularly when the periods involved are measured in millions of years. But there is a way to accelerate the process of ageing. This is based on the idea that data must be stored in an energy minimum that is separated from other minima by an energy barrier. So to corrupt data by converting a 0 to a 1, for example, requires enough energy to overcome this barrier. The probability that the system will jump in this way is governed by an idea known as Arrhenius law. This relates the probability of jumping the barrier to factors such as its temperature, the Boltzmann constant and how often a jump can be attempted, which is related to the level of atomic vibrations. Some straightforward calculations reveal that to last a million years, the required energy barrier is 63 KBT or 70 KBT to last a billion years. “These values are well within the range of today’s technology,” say de Vries and co.
And to prove the point, they go ahead and build a disk capable of storing information for this period of time. The disk is simple in conception. The data is stored in the pattern of lines etched into a thin metal disc and then covered with a protective layer. The metal in question is tungsten, which they chose because of its high melting temperature (3,422 degrees C) and low thermal expansion coefficient. The protective layer is silicon nitride (Si3N4) chosen because of its high resistance to fracture and its low thermal expansion coefficient. These guys made their disc using standard patterning techniques and stored data in the form of QR codes with lines 100nm wide. 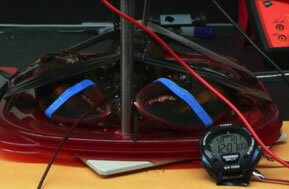 They then heated the disks at various temperatures to see how the data fared. The results are impressive. According to Arrhenius law, a disk capable of surviving a million years would have to survive 1 hour at 445 Kelvin, a test that the new disks passed with ease. Indeed, they survived temperatures up to 848 Kelvin, albeit with significant amounts of information loss. That compares well with the Rosetta Project, a proposal by the Long Now Foundation to create archival materials capable of storing information for periods in excess of 10,000 years. The new work suggests we ought to be able to preserve a significant amount of information for future civilisations, perhaps even alien ones. There are caveats, of course. The theory behind accelerated aging only applies in very specific circumstances and says nothing about survivability in other cases. It’s hard to imagine the new disk surviving a meteor strike, for example. Indeed, it would be unlikely to survive the temperatures that can occur in an ordinary house fire. But de Vries and co are confident that they can make even more robust data storage systems. Their work is an interesting step towards preserving our data for future civilisations. Be ready to keep all your crap data, Facebook shadow profile and timeline or other lolcats collection for over a million years! More interestingly and as it is mentioned in the article, this could serve the 10'000 years clock project of Stewart Brand's Long Now Foundation. Researchers at Harvard encode information in DNA at a density on par with any other experimental storage method. DNA can be used to store information at a density about a million times greater than your hard drive, report researchers in Science today. George Church of Harvard Medical School and colleagues report that they have written an entire book in DNA, a feat that highlights the recent advances in DNA synthesis and sequencing. To do this, the authors converted the computational language of 0's and 1's into the language of DNA--the nucleotides typically represented by A's, T's G's and C's; the A’s and C’s took the place of 0's and T’s and G’s of 1's. They then used off-the-shelf DNA synthesizers to make 54,898 pieces of DNA, each 159 nucleotides long, to encode the book, which could then be decoded with DNA sequencing. This is not the first time non-biological information has been stored in DNA, but Church's demonstration goes far beyond the amount of information stored in previous efforts. For example, in 2009, researchers encoded 1688 bits of text, music and imagery in DNA and in 2010, Craig Venter and colleagues encoded a watermarked, synthetic genome worth 7920 bits. DNA synthesis and sequencing is still too slow and costly to be practical for most data storage, but the authors suggest DNA’s long-lived nature could make it a suitable medium for archival storage. Erik Winfree, who studies DNA-based computation at Caltech and was a 1999 TR35 winner, hopes the study will stimulate a serious discussion about what roles DNA can play in information science and technology. “The most remarkable thing about DNA is its information density, which is roughly one bit per cubic nanometer,” he writes in an email. Where the living binds to the machine / to computation and where information seems to be the key ingredient. Somehow what Wiener and Shannon told us half a century ago. One of the most instantly recognizable features of glass is the way it reflects light. But a new way of creating surface textures on glass, developed by researchers at MIT, virtually eliminates reflections, producing glass that is almost unrecognizable because of its absence of glare — and whose surface causes water droplets to bounce right off, like tiny rubber balls. Invisible glass, invisible cloacks, darker than black black, etc. : a whole range of new (meta)materials are around the corner. With a new printing technique, researchers can now make enough metamaterials to begin fabricating invisibility cloaks and superlenses. Light warp: This is the largest sheet ever made of a metamaterial that can bend near-infrared light backwards. A new printing method makes it possible to produce large sheets of metamaterials, a new class of materials designed to interact with light in ways no natural materials can. For several years, researchers working on these materials have promised invisibility cloaks, ultrahigh-resolution "superlenses," and other exotic optical devices straight from the pages of science fiction. But the materials were confined to small lab demonstrations because there was no way to make them in large enough quantities to demonstrate a practical device. "Everyone has, perhaps conveniently, been in the position of not being able to make enough [metamaterial] to do anything with it," says John Rogers, a professor of materials science and engineering at the University of Illinois at Urbana-Champaign, who developed the new printing method. Metamaterials that interact with visible light have previously not been made in pieces larger than hundreds of micrometers. Metamaterials are made up of intricately patterned layers, often of metals. The patterns must be on the same scale as the wavelength of the light they're designed to interact with. In the case of visible and near-infrared light, this means features on the nanoscale. Researchers have been making these materials with such time-consuming methods as electron-beam lithography. Rogers has developed a stamp-based printing method for generating large pieces of one of the most promising types of metamaterial, which can make near-infrared light bend the "wrong" way when it passes through. Materials with this so-called negative index of refraction are particularly promising for making superlenses, night-vision invisibility cloaks, and sophisticated waveguides for telecommunications. The Illinois group starts by molding a hard plastic stamp that's covered with a raised fishnet pattern. The stamp is then placed in an evaporation chamber and coated with a sacrificial layer, followed by alternating layers of the metamaterial ingredients—silver and magnesium fluoride—to form a layered mesh on the stamp. The stamp is then placed on a sheet of glass or flexible plastic and the sacrificial layer is etched away, transferring the patterned metal to the surface. So far Rogers says he's made metamaterial sheets a few inches per side, but by using more than one stamp he expects to increase that to square feet. And, he says, the stamped materials actually have better optical properties than metamaterials made using traditional methods. "We can now bang out gigantic sheets of this stuff," Rogers says. Making the mold for the stamp takes care, but once that mold has been created, it doesn't take long to make many reusable stamps. Xiang Zhang, chair of mechanical engineering at the University of California, Berkeley, says this work represents an important step toward applications for optical metamaterials. "Various metamaterials could be made bigger by this method," says Zhang, who in 2008 created the design that Rogers used for this first demonstration. "For example, macroscale 2-D lenses and cloaks may be possible, and possibly solar concentrators, too." One potential application is in lenses that integrate multiple functions in single devices, for telecommunications and imaging. "This printing technique is quite powerful and has the potential to scale to very large areas," says Nicholas Fang, an associate professor of mechanical engineering at MIT. Fang says this type of metamaterial would be particularly interesting for infrared imaging devices. We published already several articles about metamaterials in | rblg, this new one from MIT Technology Review shows that we get closer to products, even if it remains in the range of invisible light. But the texts also tells something about research: some time ago now (1950-60, Element Detectors and 1970 Philips & EEV's Pryo-Electric Tubes), we discovered a way to see in the dark (infrared camera or thermal imaging), now we are inventing a (meta)material that will possibly prohibit this capacity. Next step will be evidently to invent a way to see through metamaterials (so to say: to see through invisibility...). These inventions are often related to military at first, but they have of course far larger implications once they hit the society at large. What kind of furtive or invisible architecture would I design with this material, when the actual point seems to make visible or tangible what is invisible? Will we reverse things: the invisible (digital, data, physiological, etc.) will become visible while the physical will become invisible? Or will it be used to just hide some hideous buildings or built business operations? Or in fact, more interesting, could it trigger different forms of living (we just posted about the City and the City recently)? A team led by Charles Lieber, a professor of chemistry at Harvard, and Shamik Das, lead engineer in MITRE's nanosystems group, has designed and built a reprogrammable circuit out of nanowire transistors. Several tiles wired together would make the first scalable nanowire computer, says Lieber. Such a device could run inside microscopic, implantable biosensors, and ultra-low-power environmental or structural sensors, say the researchers. Working wires: A scanning electron microscope image (top) shows a programmable nanowire circuit. 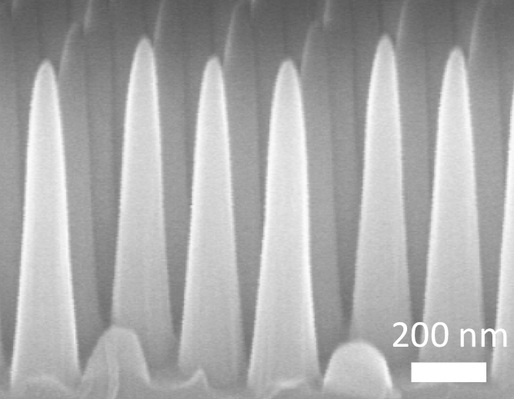 This false-colored scanning electron microscope image (bottom) shows a nanowire processor tile superimposed on top of the architecture used to design the circuit. More about it (technical), HERE. [Image: Gold nanoparticles, courtesy of Georgia Tech]. It was reported earlier this month that "gold nanoparticles can induce luminescence in leaves." That's right: glowing trees. The scientists who discovered it call it bio-LED. According to ElectroIQ, "by implanting the gold nanoparticles into Bacopa caroliniana plants, Dr. Yen-Hsun Su [of the Research Center for Applied Science in Taiwan] was able to induce the chlorophyll in the leaves to produce a red emission. Under high wavelength of ultraviolet, the gold nanoparticles can produce a blue-violet fluorescence to trigger a red emission of the surrounding chlorophyll." This has the exquisitely surreal effect of being able "to make roadside trees luminescent at night"—with the important caveat "that the technologies and bioluminescence efficiency need to be improved for the trees to replace street lights in the future." In other words, we're not quite there—but a deciduous splendor might illuminate streets near you, soon. Last spring, I should point out, I had the pleasure of teaching a research seminar at the Pratt Institute in Brooklyn, looking at blackouts: that is, landscapes—both urban and otherwise—encountered in a state of unexpected darkness. We looked at a huge variety of technologies for non-electrical illumination—sources of light for situations in which electricity has failed—from tools as basic as pocket lighters to openly whimsical investigations into bioluminescent fish, plants, algae, and bacteria, scaled up to intimations of an entire bioluminescent metropolis. But the idea that trees impregnated with gold might someday line city streets, turning night into day, is like a vision of Gustav Klimt unexpectedly crossed with Con Edison: a botanical alchemy through which base wood becomes light at the speed of photosynthesis. Now you see it: A sheet of Metaflex, a new metamaterial that could be used in devices and fabrics that can manipulate visible light. Researchers at the University of St. Andrews have created sheets of a flexible metamaterial that can manipulate visible light. "It's a pretty significant step forward," says Stephen Cummer, professor of electrical and computer engineering at Duke University and the inventor of the first metamaterial-based invisibility cloak. "At radio frequencies we know how to make a lot of these things. But at optical wavelengths, things have been very fabrication-limited." Metamaterials allow researchers to manipulate electromagnetic waves beyond the boundaries of what physics allows in natural materials. As well as promising better solar cells and high-resolution microscope lenses, metamaterials have also been used to create so-called invisibility cloaks, in which electromagnetic waves are bent around an object as if it simply weren't there. However, metamaterials must be constructed out of elements smaller than the wavelength of the electromagnetic radiation being manipulated. This means that invisibility cloaks (and most metamaterial devices in general) only work with wavelengths longer than those found in visible light, such as radio and microwave frequencies. 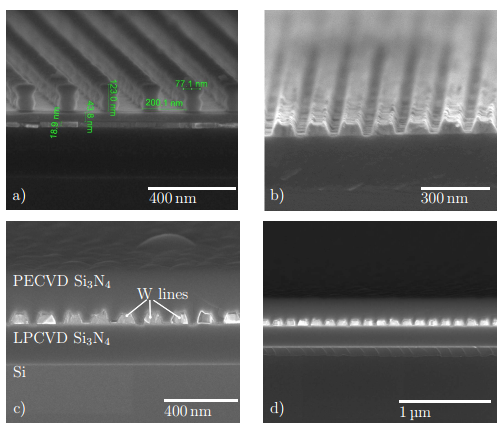 Metamaterials designed to work with optical wavelengths are built on rigid and fragile substrates, and as a result they've been confined to the lab. The new metamaterial, dubbed "Metaflex" by its creators, is manufactured on top of a rigid substrate. An initial, sacrificial layer of the material is deposited on this substrate to stop the subsequent layers from sticking to this substrate. 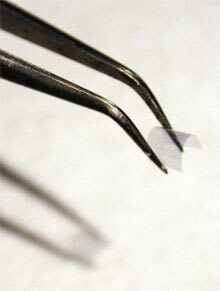 A sheet of a flexible, transparent, plastic polymer is then laid down. Next, a lithographic process, similar to that used to make silicon chips, creates a lattice of gold bars, each 100 to 200 nanometers long and 40 nanometers thick, on top of the polymer. (These bars act as "nanoantennas" that interact with incoming electromagnetic waves.) The Metaflex material is then bathed in a chemical that releases the polymer from the layer below and from the rigid substrate. By varying the length and spacing of the nanoantennas, Metaflex can be tuned to interact with different wavelengths of light. The simple sheets tested by the researchers simply blocked a portion of an incoming beam of light at specific wavelengths, but this is enough to demonstrate that Metaflex is a working metamaterial. The St. Andrew's researchers tested wavelengths as short as 620 nanometers (corresponding to a red color). So far, the researchers have produced flexible sheets as large as five by eight millimeters and as thin as four micrometers. While a fingernail-sized sample may seem small, it's a big step up from the microscopic dimensions of other optical metamaterials. The St. Andrew's scientists are confident that Metaflex can be produced in even larger sizes and at high volumes. 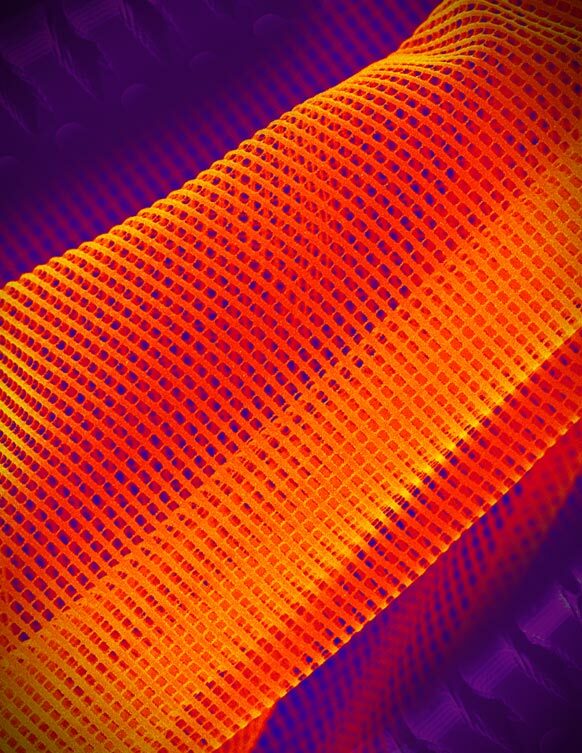 "It's absolutely scalable to industrial levels," says Andrea Di Falco, the lead author of a paper published in the New Journal of Physics yesterday that describes the material. Even at small sizes, the flexibility of the material is likely to confer some big advantages. "You really would like to be able to shape optical metamaterials into cylinders or spherical sections." This could allow, for example, the creation of curved superlenses that could magnify objects so small that they currently can't be seen with optical lenses due to diffraction effects. "On rigid substrates, it's just next to impossible to fabricate that kind of thing," says Duke University's Cummer, but with a flexible material, "you could fabricate flat and easily bend it into shape." Di Falco believes it should be possible to stack sheets of Metaflex together to create thick layers and blocks of the material, creating the first optical metamaterial with a significant three-dimensional bulk. Such a development would open the door to new properties, including, perhaps, the ability to work with more than a single wavelength at a time. Other researchers have been able to create metamaterials that can be tuned to respond to different single wavelengths after fabrication, but ideally, they'd like a material that can work across a wide band of wavelengths simultaneously. This might be achieved through stacking sheets of MetaFlex, each tuned to a different wavelength. The researchers' next step is to create these stacks and study how the properties of Metaflex change when sheets are twisted, stretched, or bent. Ultimately, Di Falco says, Metaflex could have applications such as manipulating light from an LED built into a contact lens for augmented reality, so that computer-generated images are projected onto the wearer's retina. And of course, there's invisibility. "If you have something flexible, you could embed it into a fabric. Then you could think of tuning the properties of each individual layer to change the response of the fabric, giving something similar to camouflage. So, yes—there's some grounds for [an invisibility cloak]. Not tomorrow. But that's what I'll be working on," says Di Falco.